Jennie K. Brown is a high school English teacher by day and author of children’s books by late night and weekend. 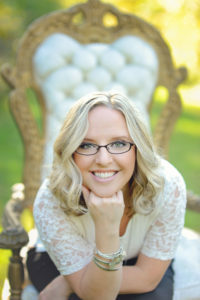 She’s the author of the award-winning middle grade Poppy Mayberry series. Jennie currently serves as past-president of the Pennsylvania Council of Teachers of English and Language Arts (PCTELA) and she is an active member of SCBWI, NCTE, ALAN and Sisters in Crime. When Jennie’s not teaching or writing, she can be found reading, hanging out with her awesome family, visiting antique shops, or plotting her next book! Oh, and she also LOVES all-things Shakespeare! Through Snowy Wings Publishing, Jennie is the author of A Haunting in Hollowfield (fall 2019), the first book in her middle grade mystery series about a young girl who works in her family’s antique shop and can see the memories associated with the antiquated items she touches. You can read more about Jennie on her website at www.jenniekbrown.com.